Name Variation William H. Baumgarten was also known as Wilhelm H.
Name Variation William H. Baumgarten was also known as W. H.
William H. Baumgarten was born in 1876 at Westfield, Sauk, Wisconsin. He was the son of Wilhelm Baumgarten and Dorothea Hamburg. William H. Baumgarten married Emma D. Stolte, daughter of John Stolte and Marie Huedeng, on 14 November 1902 at Loganville, Sauk, Wisconsin. William H. Baumgarten died in 1936. [S244] U.S. Federal Census 1910 U.S. Federal Census, by Ancestry.com, Year: 1910; Census Place: Westfield, Sauk, Wisconsin; Roll: T624_1737; Page: 4A; Enumeration District: 0130; Image: 132; FHL Number: 1375750. [S243] U.S. Federal Census 1920 U.S. Federal Census, by Ancestry.com, Year: 1920; Census Place: Westfield, Sauk, Wisconsin; Roll: T625_2015; Page: 11A; Enumeration District: 171; Image: 284. Name Variation Wilhelm Baumgarten was also known as William. Wilhelm Baumgarten married Dorothea Hamburg. Wilhelm Baumgarten was born on 18 January 1850 at Hanover, Germany. Wilhelm Baumgarten died on 17 December 1910 at age 60. Married Name Her married name was Baumgarten. Name Variation Dorothea Hamburg was also known as Dorathea. Dorothea Hamburg married Wilhelm Baumgarten, son of Friedrich Baumgarten and Wilhelmine Katherina Henrietta Estorf. Dorothea Hamburg was born on 16 November 1857 at Germany. She died on 19 March 1938 at age 80. John Baptiste Brei was born in September 1838 at Germany. He married Anna Schwarz circa 1864. John Baptiste Brei died after 1920. [S245] U.S. Federal Census 1900 U.S. Federal Census, by Ancestry.com, ED134. Dwelling 107. Name Variation Anna Schwarz was also known as Maria. Married Name circa 1864 As of circa 1864,her married name was Brei. Anna Schwarz was born in April 1835 at Germany. She married John Baptiste Brei circa 1864. Anna Schwarz died before 1910. Anna Schwarz had 6 with 3 living in 1900 children. Michael Fellner married Margaretha Schwarz. Married Name Her married name was Fellner. Margaretha Schwarz married Michael Fellner. Name Variation Joseph Brei was also known as Joe. Joseph Brei was born in 1873 at Bear Creek, Sauk, Wisconsin. He was the son of John Baptiste Brei and Anna Schwarz. Joseph Brei married Otilla F. Nachreiner, daughter of Joseph X. Nachreiner and Theresa Brneckl, on 29 January 1902 at Franklin, Sauk, Wisconsin. Joseph Brei died in 1955. 1 June 1905 Bear Creek, Sauk, Wisconsin Joseph Brei appeared on the census of 1 June 1905 at Bear Creek, Sauk, Wisconsin. [S244] U.S. Federal Census 1910 U.S. Federal Census, by Ancestry.com, ED110. Dwelling 111. [S243] U.S. Federal Census 1920 U.S. Federal Census, by Ancestry.com, Year: 1920; Census Place: Willow, Richland, Wisconsin; Roll: T625_2013; Page: 9A; Enumeration District: 209; Image: 428. Name Variation Otilla F. Nachreiner was also known as Otilie. Name Variation Otilla F. Nachreiner was also known as Hottilica. Name Variation Otilla F. Nachreiner was also known as Ovilla. Name Variation Otilla F. Nachreiner was also known as Ottillie T.
Name Variation Otilla F. Nachreiner was also known as Nachriner. Married Name 29 January 1902 As of 29 January 1902,her married name was Brei. Otilla F. Nachreiner was born in May 1879 at Franklin, Sauk, Wisconsin. She was the daughter of Joseph X. Nachreiner and Theresa Brneckl. Otilla F. Nachreiner married Joseph Brei, son of John Baptiste Brei and Anna Schwarz, on 29 January 1902 at Franklin, Sauk, Wisconsin. Otilla F. Nachreiner died in 1926. 1 June 1905 Bear Creek, Sauk, Wisconsin Otilla F. Nachreiner appeared on the census of 1 June 1905 in the household of Joseph Brei at Bear Creek, Sauk, Wisconsin. Otilla F. Nachreiner had 3 with 3 living in 1910 children. [S246] U.S. Federal Census 1880 U.S. Federal Census, by Ancestry.com, NA Film Number T9-1446 Page Number 104C. [S245] U.S. Federal Census 1900 U.S. Federal Census, by Ancestry.com, ED134. Dwelling 52. Name Variation Joseph X. Nachreiner was also known as Joseph K.
Name Variation Joseph X. Nachreiner was also known as Nachriner. Joseph X. Nachreiner was born on 11 June 1846 at Bavaria, Germany. He was the son of Michael Nachreiner and Franciska Frank. Joseph X. Nachreiner married Theresa Brneckl, daughter of Daniel Brickl and Maria Retzer, on 13 June 1872. Joseph X. Nachreiner died in 1925.
matter of advancement and progress. all of whom are still living except Michael. member of the Catholic Church. Herbert, deceased; and Rudolph, who married Rosella Heiser. Joseph X. Nachreiner immigrated with Franciska Frank and Michael Nachreiner in 1854. [S248] U.S. Federal Census 1860 U.S. Federal Census, by Ancestry.com, Page 161. Dwelling 1221. [S247] U.S. Federal Census 1870 U.S. Federal Census, by Ancestry.com, Page 11. Dwelling 78. [S243] U.S. Federal Census 1920 U.S. Federal Census, by Ancestry.com, ED164. Dwelling 8. Name Variation Theresa Brneckl was also known as Teresa. Name Variation Theresa Brneckl was also known as Theresia. Name Variation Theresa Brneckl was also known as Brueckel. Name Variation Theresa Brneckl was also known as Breikl. Married Name 13 June 1872 As of 13 June 1872,her married name was Nachreiner. Married Name 13 June 1872 As of 13 June 1872,her married name was Nachriner. Theresa Brneckl was born in 1852 at Bavaria, Germany. Theresa Brneckl married Joseph X. Nachreiner, son of Michael Nachreiner and Franciska Frank, on 13 June 1872. Theresa Brneckl was listed as a beneficiary in Daniel Brickl's will on 6 September 1887 at Sauk, Wisconsin. Theresa Brneckl died in 1894. Name Variation Gustave Julius Breitzke was also known as Gustaf. Name Variation Gustave Julius Breitzke was also known as Gust. Name Variation Gustave Julius Breitzke was also known as Gustav. Gustave Julius Breitzke was born on 29 July 1876 at Germany. 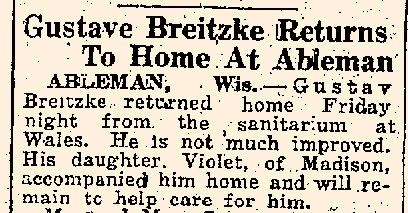 He was the son of Charles Breitzke and Emilie Reetz. 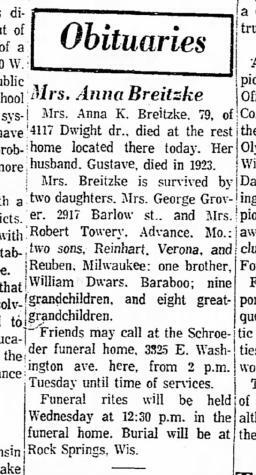 Gustave Julius Breitzke married Anna Sophia Dwars, daughter of Gustav Dwars and Mary Schmidt, on 9 May 1903 at Excelsior, Sauk, Wisconsin. Gustave Julius Breitzke died in 1923. Ship Name: Spaarndam. On 26 January 1923 Gustave Breitzke returned home from the sanitarium, but he is not much improved. [S244] U.S. Federal Census 1910 U.S. Federal Census, by Ancestry.com, ED113. Dwelling 17. [S243] U.S. Federal Census 1920 U.S. Federal Census, by Ancestry.com, ED152. Dwelling 36. Name Variation Anna Sophia Dwars was also known as Dewars. Name Variation Anna Sophia Dwars was also known as Anna K.
Married Name 9 May 1903 As of 9 May 1903,her married name was Breitzke. Anna Sophia Dwars was born in October 1881 at Westfield, Sauk, Wisconsin. She was the daughter of Gustav Dwars and Mary Schmidt. Anna Sophia Dwars married Gustave Julius Breitzke, son of Charles Breitzke and Emilie Reetz, on 9 May 1903 at Excelsior, Sauk, Wisconsin. Anna Sophia Dwars died on 17 October 1960 at Madison, Dane, Wisconsin. Anna Sophia Dwars had 4 with 4 living in 1910 children. On 4 June 1928 Confirmation dinner by Mrs. John Breitzke for her daughter Clara. On 6 June 1928 Surprise party for Margaret Friede. [S245] U.S. Federal Census 1900 U.S. Federal Census, by Ancestry.com, Year: 1900; Census Place: Excelsior, Sauk, Wisconsin; Roll: T623_1816; Page: 14B; Enumeration District: 132. [S373] U.S. Federal Census 1940 U.S. Federal Census, by Ancestry.com, Year: 1940; Census Place: Madison, Dane, Wisconsin; Roll: T627_4469; Page: 2B; Enumeration District: 13-40. Name Variation Gustav Dwars was also known as Gustave. Gustav Dwars was born in December 1845 at Germany. He married Mary Schmidt circa 1872. Gustav Dwars died on 8 February 1926 at age 80. [S246] U.S. Federal Census 1880 U.S. Federal Census, by Ancestry.com, NA Film Number T9-1446 Page Number 84C. [S244] U.S. Federal Census 1910 U.S. Federal Census, by Ancestry.com, Year: 1910; Census Place: Excelsior, Sauk, Wisconsin; Roll: T624_1736; Page: 15A; Enumeration District: 113; Image: 865. Name Variation Mary Schmidt was also known as Maria. Married Name circa 1872 As of circa 1872,her married name was Dwars. Mary Schmidt was born in April 1854 at Germany. She married Gustav Dwars circa 1872. Mary Schmidt died in 1942. Mary Schmidt had 7 with 5 living in 1900 children. She had 7 with 5 living in 1910 children. 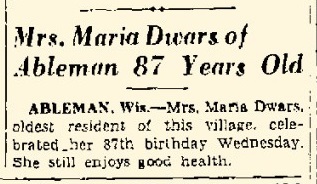 In April 1941 Maria (Schmidt) Dwars 87th birthday celebration. Name Variation Michael Alt was also known as Mike. Name Variation Michael Alt was also known as Michel. Michael Alt was born in December 1867 at Plain, Sauk, Wisconsin, also reported as Dec 1869. He was the son of Wolfgang Alt and Margaretha Bindl. Michael Alt married Catherine Pletzer, daughter of John Pletzer and Margareth Ring, on 8 May 1889 at Plain, Sauk, Wisconsin. Michael Alt died in 1940. 20 June 1895 Franklin, Sauk, Wisconsin Michael Alt appeared on the census of 20 June 1895 at Franklin, Sauk, Wisconsin, 4 male and 2 female; 6 born in US, 0 born in Germany; living next door to W. (Wolfgang Alt) and 3 houses from And. (Andreas) Alt. [S246] U.S. Federal Census 1880 U.S. Federal Census, by Ancestry.com, ED251. Page 13. Dwelling 107. Name Variation Wolfgang Alt was also known as W.
Wolfgang Alt was born on 31 October 1831 at Bavaria, Germany, also reported as Oct 1835. Wolfgang Alt married Margaretha Bindl, daughter of Ignatz Bindl and Catharina Roetzer, circa 1866. Wolfgang Alt died on 4 September 1911 at age 79. 20 June 1895 Franklin, Sauk, Wisconsin He appeared on the census of 20 June 1895 at Franklin, Sauk, Wisconsin, 5 male and 4 female; 7 born in US, 2 born in Germany; living next door to M. (Michael Alt) and 3 houses from And. (Andreas) Alt. on same ship as future wife, Margaretha Bindl. [S245] U.S. Federal Census 1900 U.S. Federal Census, by Ancestry.com, ED134. Dwelling 168. [S244] U.S. Federal Census 1910 U.S. Federal Census, by Ancestry.com, Year: 1910; Census Place: Franklin, Sauk, Wisconsin; Roll: T624_1736; Page: 7A; Enumeration District: 115; Image: 893. Name Variation Margaretha Bindl was also known as Marg. Name Variation Margaretha Bindl was also known as Margareta. Name Variation Margaretha Bindl was also known as Margaret. Married Name circa 1866 As of circa 1866,her married name was Alt. Margaretha Bindl was born on 15 December 1849 at Bavaria, Germany. Margaretha Bindl married Wolfgang Alt, son of (?) Alt, circa 1866. Margaretha Bindl died on 25 January 1897 at age 47 47y. 20 June 1895 Franklin, Sauk, Wisconsin Margaretha Bindl is counted on the census of 20 June 1895 in the household of Wolfgang Alt at Franklin, Sauk, Wisconsin; 5 male and 4 female; 7 born in US, 2 born in Germany; living next door to M. (Michael Alt) and 3 houses from And. (Andreas) Alt. Joseph Alt was born in June 1873 at Plain, Sauk, Wisconsin, also reported as Jun 1872. 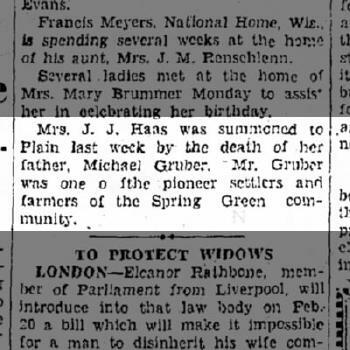 Joseph Alt married Rose Gruber, daughter of Michael Gruber and Frances Ruhland, on 4 June 1902 at Plain, Sauk, Wisconsin. Joseph Alt died in 1936. 20 June 1895 Franklin, Sauk, Wisconsin Joseph Alt is counted on the census of 20 June 1895 in the household of Wolfgang Alt at Franklin, Sauk, Wisconsin; 5 male and 4 female; 7 born in US, 2 born in Germany; living next door to M. (Michael Alt) and 3 houses from And. (Andreas) Alt. Name Variation Rose Gruber was also known as Rosina. Married Name 4 June 1902 As of 4 June 1902,her married name was Alt. Rose Gruber was born in March 1879 at Bear Creek, Sauk, Wisconsin. Rose Gruber married Joseph Alt, son of Wolfgang Alt and Margaretha Bindl, on 4 June 1902 at Plain, Sauk, Wisconsin. Rose Gruber died in 1965. [S246] U.S. Federal Census 1880 U.S. Federal Census, by Ancestry.com, Family History Library Film 1255446 Page Number 102C. Name Variation Michael Gruber was also known as Mike. Name Variation Michael Gruber was also known as Bernard. Michael Gruber was born on 23 April 1849 at Bavaria, Germany, also reported as May 1849. He married Frances Ruhland, daughter of Franz Xavier Zilker and Barbara Ruhland, on 20 August 1872. Michael Gruber died on 30 January 1931 at age 81 Michael Gruber, Sr. was born in Waldmuenchen, Bavaria, Germany April 26, 1849 and departed this life Friday January 30, 1931 at the home of his daughter, Mrs. John Brechtl, aged 81 years, 9 months and 11 days. The funeral services were conducted at St. Luke's chapel, Plain by the Rev. Frs. Beschta, Surges and Zaun, interment being made in St. Luke's new cemetery. The decedent came from Waldmuenchen to Buffalo, New York in 1871 and in 1872 was united in marriage to Miss Frances Ruhland. To this union, eleven children were born; three sons, Joseph, Michael, Jr. and Anthony; and eight daughters, Mrs. John Brechtl, Mrs. Alois Pletzer, Mrs. John Blau, Mrs. Jos. Alt, Mrs. Jos. Blau Sr., Mrs. John Haas, Mrs. Simon Nachreiner and Mary Ann who died at the age of nine months. Mr. Gruber also leaves to mourn 64 grandchildren; 29 great-grandchildren and a host of other relatives and friends. In the year 1874, Mr. Gruber moved from Buffalo, New York to Wisconsin and as one of the early settlers, worked hard at clearing land and building a home for his family. His first location was on the farm now owned by Jos. Alt where he resided 28 years. From there he moved to Plain to recuperate his health. Then he went to Big Hollow on the farm of Michael Jr. and in 1913 bought the farm now owned by his son Tony. In 1916, he moved to Spring Green where he resided until the death of his wife in 1925. When he went to Plain and spent his declining years with Mrs. John Blau and Mrs. Brechtl. He was buried after 30 January 1931 at St. Luke's New Cemetery, Sauk, Wisconsin. Michael Gruber immigrated in 1870. [S244] U.S. Federal Census 1910 U.S. Federal Census, by Ancestry.com, ED126. Dwelling 91. Name Variation Frances Ruhland was also known as Franziska. Name Variation Frances Ruhland was also known as Francis. Name Variation Frances Ruhland was also known as Ruland. Married Name 20 August 1872 As of 20 August 1872,her married name was Gruber. Frances Ruhland was born on 24 October 1848 at Bavaria, Germany, also reported as Oct 1849. She was the daughter of Franz Xavier Zilker and Barbara Ruhland. Frances Ruhland married Michael Gruber on 20 August 1872. Frances Ruhland died on 9 April 1925 at age 76. Franziska (Frances) Ruhland was born October 24, 1848 at Untergrafenried, Kreis Cham, Oberpfalz, Bayern, Germany. She was the daughter of the unmarried couple, Xaver Zilker (of Hocha) and Barbara Ruhland. Catholic church records at Ast, Kreis Cham, show the baptism was October 24, 1848; the sponsor was an aunt, Walburga Dietl of Obergrafenried. Frances Ruhland immigrated in 1870. She had 12 with 10 living in 1900 children. She had 10 with 10 living in 1910 children. Name Variation Lidwina Nachreiner was also known as Ludwine. Married Name 19 October 1904 As of 19 October 1904,her married name was Alt. Lidwina Nachreiner was born on 7 April 1884 at Franklin, Sauk, Wisconsin. Lidwina Nachreiner married George Alt, son of John Alt and Franciska Wild, on 19 October 1904. Lidwina Nachreiner died in July 1978 at age 94. Lidwina Nachreiner obtained US Social Security Card at Wisconsin; last residence Milwaukee, Milwaukee, Wisconsin. [S250] U.S. Federal Census 1930 U.S. Federal Census, by Ancestry.com, ED15. Dwelling 422. George Alt was born circa 1884 at Bavaria, Germany. He was the son of John Alt and Franciska Wild. George Alt married Lidwina Nachreiner, daughter of Joseph X. Nachreiner and Theresa Brneckl, on 19 October 1904. John Alt married Franciska Wild. John Alt was born in 1847. He was buried in 1924 at Old St Lukes Cemetery, Franklin, Sauk, Wisconsin. Name Variation Franciska Wild was also known as Francis. Franciska Wild married John Alt. Franciska Wild was born on 10 March 1856. She died on 12 March 1935 at age 79. She was buried after 12 March 1935 at Old St Lukes Cemetery, Franklin, Sauk, Wisconsin, tombstone death date not filled in, so likely buried elsewhere. Married Name circa 1899 As of circa 1899,her married name was Bauer. Married Name 18 January 1899 As of 18 January 1899,her married name was Bauer. Francis Alt was born in September 1880 at Germany. 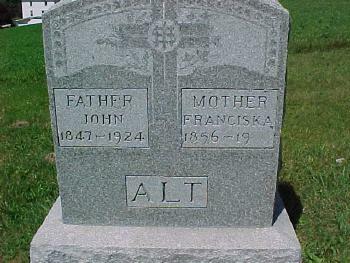 She was the daughter of John Alt and Franciska Wild. Francis Alt married George Bauer, son of Joseph Bauer and Anna Leis, on 18 January 1899 at Plain, Sauk, Wisconsin. Francis Alt died before 1920. Francis Alt immigrated in 1888. She had 1 with 1 living in 1900 children. She had 6 with 6 living in 1910 children. [S245] U.S. Federal Census 1900 U.S. Federal Census, by Ancestry.com, ED134. Dwelling 110. [S244] U.S. Federal Census 1910 U.S. Federal Census, by Ancestry.com, ED115. Dwelling 40. George Bauer was born in December 1877 at Franklin, Sauk, Wisconsin. He was the son of Joseph Bauer and Anna Leis. George Bauer married Francis Alt, daughter of John Alt and Franciska Wild, on 18 January 1899 at Plain, Sauk, Wisconsin. George Bauer died after April 1930. [S246] U.S. Federal Census 1880 U.S. Federal Census, by Ancestry.com, NA Film Number T9-1446 Page Number 102C. [S243] U.S. Federal Census 1920 U.S. Federal Census, by Ancestry.com, ED66. Dwelling 86. [S250] U.S. Federal Census 1930 U.S. Federal Census, by Ancestry.com, ED5. Dwelling 21. Joseph Bauer was born on 10 October 1835 at Bavaria, Germany. He married Anna Leis circa 1858. 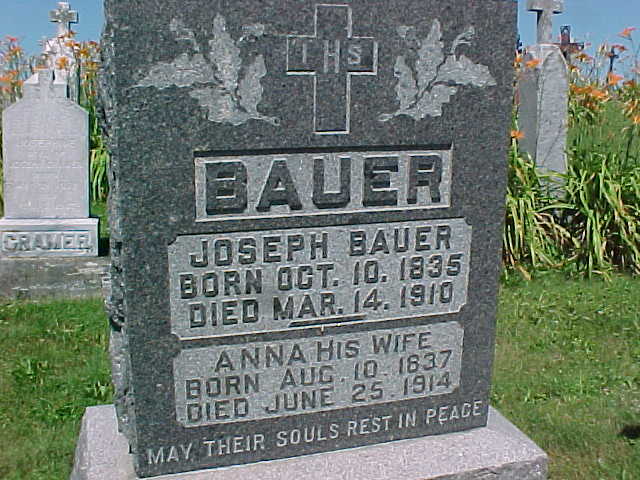 Joseph Bauer died on 14 March 1910 at age 74. He was buried after 14 March 1910 at Old St Lukes Cemetery, Franklin, Sauk, Wisconsin. Joseph Bauer and Anna Leis immigrated in 1873. Name Variation Anna Leis was also known as Annie. Married Name circa 1858 As of circa 1858,her married name was Bauer. Anna Leis was born on 10 August 1837 at Bavaria, Germany. She married Joseph Bauer circa 1858. Anna Leis died on 25 June 1914 at age 76. She was buried after 25 June 1914 at Old St Lukes Cemetery, Franklin, Sauk, Wisconsin. Anna Leis and Joseph Bauer immigrated in 1873. Anna Leis had 12 with 7 living in 1900 children. She had 7 with 5 living in 1910 children. [S244] U.S. Federal Census 1910 U.S. Federal Census, by Ancestry.com, ED115. Dwelling 35.